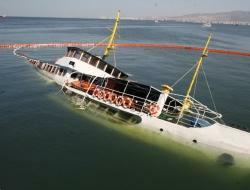 The 44 meter long, 483 gt ferry Ishan Alyanak sank at the port of Izmir, Turkey after the vessel struck the pier. The ferry with 250 passengers was approaching the pier when the rudder failed resulting in the collision. 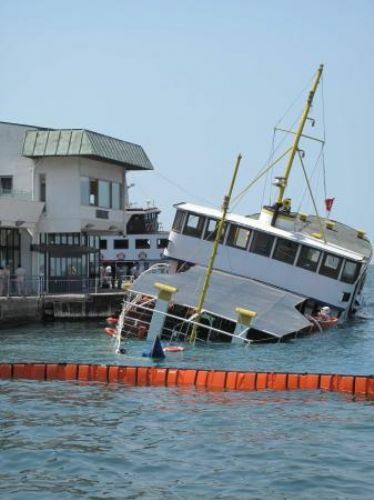 Reports state the there was some panic on board, but all passengers were able to safely reach the pier. 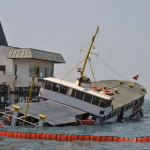 The Ishan Alyanak’s hull was punctured and water ingress flooded the vessel until it sank with just the superstructure above the surface. 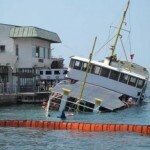 The ferry had 10 tons of diesel fuel and 300 liters of oil was released. Authorities have placed a boom around the Ishan Alyanak to prevent the spread of the pollution. 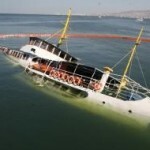 One report stated the vessel had a fire broke out in the stern section which may have lead to the rudder failing.